Progressive field is a major league baseball ballpark located in downtown Cleveland, Ohio and home to the Cleveland Indians for more than 20 years. Progressive Field championed a series of renovations that make game-day a one-of-a-kind, can’t-miss experience for fans. Cleveland’s Progressive Field delivers tradition and nostalgia to millions of loyal fans, but like many stadiums, it was inherently challenging to navigate. The old signage pointed fans in too many directions, fostering anxiety in a crowded environment. 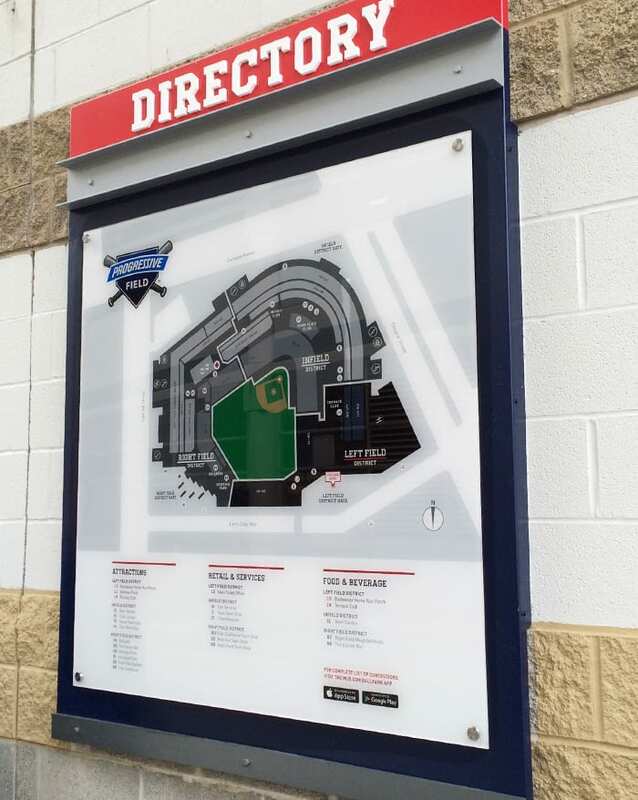 In addition to new directionals and identification signage, maps and directories were made to help visitors find their way around the ballpark. A wayfinding strategy built on the concept of “districting” (zoning) so that fans can orient themselves within the stadium, instead of by street names on the exterior of the stadium. A signage system that walks fans through the entire ballpark journey, with signs that are needed at each stage of a fan’s visit. From approaching the stadium to getting back to their car, and all the stops along the way. Updated signage to reflect a blend of Tradition and Grit, while utilizing the team’s recognizable navy, red and grey color palette for an on-brand look and feel. Messaging strategy for signage that is flexible enough to account for the fact that renovations are completed in stages, rather than all at once. This allows the wayfinding strategy to be replicated throughout the stadium as updates progressed.